How to enable TLS on Virtual Machine? TLS is one kind of protocol which provides communication security between client/server applications that communicate with each other over the Internet. It enables privacy, integrity and protection for the data that's transmitted between different nodes on the Internet. TLS is a successor to the secure socket layer (SSL) protocol. Its main work is to enable the web browsing, applications access, data transfer and most of the Internet based communication in a more secure way. It prevents the transmitted/transported data from being eavesdropped or tampered. TLS is used to secure Web browsers, Web Hosting, VPNs, database servers and many more. TLS Handshake Protocol: Enables the client and server to authenticate each other and select a encryption algorithm prior to sending the data. TLS Record Protocol: This is an unique protocol mainly work on the standard TCP protocol to ensure that the created connection is secure and reliable. It also provides data encapsulation and data encryption services. What is the need of TLS to secure your email? Most of the email server supports the use of TLS is for avoiding a data leak, ensuring that there are no prying eyes on confidential information or validating that someone received your message. For instance, whenever you are sending a message from your email server to another email server over TLS, the connection itself is encrypted so no one can intercept the payload information. Moreover the actual data itself is still unencrypted. 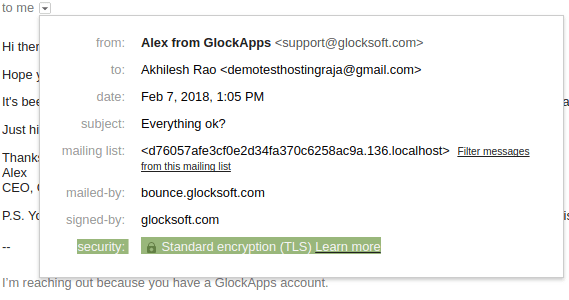 It’s secure and compliant because it was sent over an encrypted channel. This is the key for ensuring the protection of user names, passwords, personal details, and other sensitive information that’s often found in emails. You can see Search box on the right hand side, kindly search for email config and click on it. Under Email Config Module you can see the check box for enabling tls just select it and click on Save changes. Note: Before enabling the TLS make sure that SSL is installed for particular domain or not. If not first install SSL certificate for it then enable tls. Once TLS is enabled for your domain you can see the TLS under security section of recipient.